As months go, January has been brutal. The climate, both meteorological and political, has taken a mighty toll. I'm ready to bid farewell and look for some silver linings. Hello, February! The garden is a place for healing, it's my happy place, even if it is in its infancy. So it is especially heartbreaking when this brand-new garden with its tiny little plants endures four weeks of extreme weather. I lost some plants to be sure, others might bounce back and still others won't show signs of stress until later in the year. So I am taking inventory of the losses as well as looking for that silver lining. Gratefully, my Grevillea victoriae survived virtually untouched. My boss at Joy Creek Nursery told me to shake off any excess snow as that is what usually does these in. Although it has no blooms right now, I am simply happy that it survived. A nice silver lining, indeed. In that spirit, here are a few more silver linings and projects that have preoccupied us the last few weeks. One project that gives us enthusiasm is planning the (small) orchard. In the rear bed there are some six bare-root fruit trees awaiting planting. More have been ordered online and are on the way. Also awaiting their permanent homes are several blueberry shrubs, fig trees, a persimmon, and I also have raspberries ordered. We will also have asparagus, artichokes and a large variety of veggies. The bed in the foreground has amazingly been great for salad greens. They all shriveled and were counted as goners during the snow and ice, but here they are in their green, edible glory. Here the site for the future (small) orchard has been cleared by Facilities Manager. Just stumps and a few piles of branches remain. The food-producing portion of our garden will take up about a quarter of an acre. There is an oak tree center-right in this photo -- from that point down hill to approximately where I am standing will all be orchard and veggie garden. The eastern and western boundaries of the food garden stop at the fences just visible on either side of this photo. As trees and brush were cleared to make way for the food garden, we saved several large piles of branches to create habitat for birds and critters. Just north of the food garden will be the completely wild area were we are simply removing blackberries and invasive weeds and introducing native plants. We will let it be a random forest mix and hopefully the wildlife will approve. Here are two other piles as well as a quaking aspen (Populus tremuloides) we just planted. The two ferns were also planted, Facilities Manager saved them while he cleared the land for the food garden and relocated 20 so far in this wilder area. Here, 20 Western sword ferns or Polystichum munitum await planting in their new locale. This is looking due north. The big leaf maple was cut down as it was diseased. Too bad, it was a lovely old tree. We are going to leave the stump to slowly decompose while making the felled trunk into a very rustic bench right where it now lies. Barely visible in this photo are several of the relocated sword ferns that FM planted around. There is also Oregon grape or Mahonia nervosa. I will also plant many evergreen huckleberries or Vaccinium ovatum and red-twig dogwood or Cornus sericea in this area. Although difficult to transplant, I will also move some salal or Gaultheria shallon from the soon-to-be-orchard to this area. Facilities Manager has been busy. This is log fort #2. We have no lack of wood. Now for the losses. Regarding the former agave, I realize I should have moved it into the garage. The thing is, it's borderline hardy for us and I was tired of dragging things in and out. I had this theory that by placing it next to the house and under the eaves it would be sheltered just enough to muscle through. After all, every time I took it inside for the winter it took weeks to come out of its funk and never really looked great. So I took a gamble and lost. I really don't have a lot of patience to baby plants with this much to take care of, so I'm not that heartbroken. Sad, but fine. The Cycas revoluta or sago palm also looks like toast. Apply the same line of thinking to this plant, too. One thing I am immensely sad about is the state of this Astelia 'Red Gem.' It survived bitter east winds at the old house for a few years as well as snow and ice storms. It was simply buried in the snow for far too long here. I haven't completely given up hope, however, as the base is quite green and might regenerate new leaves. I am going to leave it where it is and hope for a miracle. This is a Feijoa sellowiana or pineapple guava. It is hardy in our area but the leaves were frozen for far too long, I think. It might regenerate new leaves, so as with the astelia, I will leave it as it is and see what happens. The leaves should be a lovely silver green, not brown. This makes me extremely sad. One of the three Ceanothus 'Italian Skies' from Xera Plants really took a beating. It flopped over and is very snow and ice damaged. The other two which are smaller fared much better. I will wait for it to bloom then prune the burned leaves and branches out. This also makes me sad. Three Agave ovatifolia, hardy to our region, did not fare very well. They are planted in the labyrinth garden and did well through the first three or so rounds of snow and ice. They were troopers. But being under 15" of snow for over a week really did them in. The leaves are mushy at the base. I am fairly certain these are goners. Had they been larger, they would likely have fared much better. Grevillea gaudichaudii is questionable. I would be very surprised if it made it, but there are parts that are still quite alive so I'll leave it where it is and hope for some new growth. This Delosperma 'Fire Spinner' (ice plant) has seen better days. Maybe that little bit at the bottom will hang in there. Another huge heart breaker are the seven or so silly prostrate rosemary plants I have along the retaining wall. I say silly because they are so common, but I loved them. They too were completely covered in snow for over a week and just succumbed to the frozen mess. They were going to be so pretty along this wall and were finally growing. I will replace them. All of them. Back to the silver linings, plants that fared like champs. This Brachyglottis greyi (Senecio) looks great. I hope it doesn't wither on me later on, for it's not incredibly hardy. Plants really can surprise you. Some of the borderline hardy ones did great while the hardy ones suffered. All of my callistemons came through unscathed. Callistemon sieberi pictured here. This Hebe 'Red Edge' and all other hebes did too. Yucca aloifolia 'Blue Boy' - another marginally hardy one for me -- looks fantastic. Perhaps it's doing so well because it is planted in really well-draining gravelly soil. The Phormium tenax might pull through. I know now to leave it be, as after several bad winter storms in Portland, many in my former neighborhood regrew from the roots. I was too hasty tossing my favorite flax in the past. Another hebe looking great. Hebe pinguifolia 'Sutherlandii'. Arctostaphylos 'Saint Helena' from Xera Plants fared very well. Some of the branches kind of flopped over but they will recover in time. I am hopeful. Ozothamnus rosmarinifolius 'Silver Jubilee' came through unscathed. I think the Leptospermum lanigerum 'Silver Form' (also from Xera) looks o.k. The Pittosporum tenuifolium 'Irene Patterson' seems like it did fairly well. It was completely under snow and quite flopped over when the snow finally melted but has become more upright as the season drags on. The hens have been so happy to get outside now that the snow has melted. They are very sweet and follow me all over the garden. They are venturing farther and farther every day, which is good because they have a lot of ground to cover. They had confined themselves to the coop, under the deck and the gravel garden. Now they have found the perfect place for their latest obsession - dust baths. Here all four of them get in on the act. It's a mass of feathers. They love this activity and were apparently desperately missing it while confined during the worst of the weather. It keeps them clean and free of mites, apparently. Plus, it's comical to watch. And here's the best silver lining of all, Miss Effie gave us two eggs. Yay! We didn't expect any eggs at all this winter but lo-and-behold, a beautiful blue-ish egg. This photo makes it look bluer than it was. Effie, by the way, is the pretty gray hen. Thanks, Effie! We have hope the others will soon follow suit now that they've been dust bathing and foraging for tasty bugs fairly regularly. There's Effie, front and center. Family portrait of the girls and the now-interested-in-chickens-Hobbes. He really wants to meet them but they're not having it. He eventually gives up and finds a nice spot of grass to eat instead. Easily distracted. The last several days have been quite dry, so I have seized the opportunity to do a little clean-up as new growth is surprisingly coming on. Here is a "before" shot taken on Monday. The "after" shot taken a few hours later does not look so different, except the grasses and perennials have been cut back as has the flopped over Eupatorium 'Elegant Feather' which had been bugging me for two months. I could have left it all for a few more weeks but I needed some garden therapy. It helped. This is the site of the many Carex comans 'Frosty Curls' and Miscanthus sinensis 'Cabaret' that have all been given a thorough haircut. I feel much better, thank you. The girls, or chickens, helped every step of the way, let me tell you. Ok, not a silver lining but a golden one. Even better. The garden, I admit, looks pretty bleak right now. That's because so many of the evergreen shrubs and trees that are key players in establishing a sense of place are quite small right now. They will fill in over the years and help define garden beds and areas. Once the perennials and grasses emerge, of course it will be full speed ahead gardening. For now, the quiet of winter will have to do. The silver, or gold, lining for us is that we have this place and one another. Nature is something we not only live in and appreciate, it provides life for us all. If we don't nurture it, we are ultimately the ones who suffer. By nurturing it, we are taking care of our little community. The losses we experienced in the garden this past winter we will get over. We will keep planting and move on, weeding out the less hardy plants in favor of ones that can take brutal storms and still look like champs. We can learn a lot from plants. The losses are hard to take, but there's a lot still looking good. As you say, we will move on and keep planting! I'm really impressed with Grevillea victoriae. My plants are all under 1' tall, but most made it through with only minimal damage. A couple really tiny ones might be toast. Conversely, both Marshall Olbricht look like goners. I'm not ready to give up on them, though. I'll plant new ones this spring so that they're more established. Same thing with my callistemon. Only pityoides Mt. Kosciuszko form and pallidus 'Best Blue' look undamaged. The others all look like they will die to the ground. Hopefully some will come back from the roots. My Brachyglottis 'Otari Cloud' are collapsing. Not sure how far back they'll die, but they might come back, too. I'll give Brachyglottis another try. I'm worried about my leptospermums. I think I may have some major fallout as the weather warms. That Grevillea is very surprising. It grew really well last year and still looks fantastic. I gave it no compost, of course, so maybe it just really likes where it is. Sounds like we're both in the same boat...it's nice to consider some of these plants could come back from their roots. I will leave most of them anyhow as there's so much room to fill that it doesn't matter if I leave them or not, so why not have a bit of an experiment? Do the Brachyglottis in your experience usually fare well in bad weather? I hope the leptos are ok, those are some of my favorites. Keep us posted how they do. I think "wait and see" is the only way to proceed. Hard to know what the plants have up their sleeves until well into the growing season (and sometimes even in a year or two). Good to know that Effie does not rely on beauty alone to win your heart. That's one beautiful egg! Wait and see...another dimension to gardening....one must have patience, something I often sorely lack. Well...as you say, we've got the hens to provide a little beauty! That's one beautiful sunset and the blue egg is pretty special too! I'm sorry to see all your losses but join you in applauding the survivors. I was really surprised by the loss of the rosemary - I think of those as indestructible but then mine have never had to face your kind of cold. 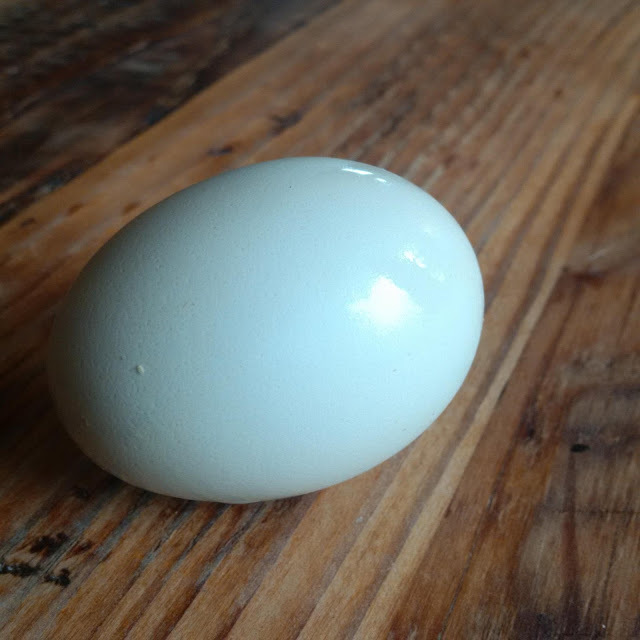 Isn't the blue egg cool? I was so proud of her, I did not expect any eggs at all until spring. And yes, the rosemary. So sad! They are ubiquitous here in the Portland area and there are about 7 other very healthy ones in the berm where the dead ones are...it's just these dead ones are against a retaining wall which is great for heat in the summer, but in winter...oy...they seem to get too much water. Or maybe they were too new to survive. In any event, I'll need something to replace them with - and yes, I might try rosemary again. Foolish Tamara...! Looks like you're progressing wonderfully. Each new year will have its battles, losses and successes. It's all about the journey. Can't wait to see what you accomplish this year! Aw, thanks Matthew. Yes, this battle is one we all have to contend with. I will remind myself about the journey. I can't wait to see what you do this year too! Also really looking forward to having the blogger's plant swap at your place! Oh that poor mushy Agave! What was it? Before it turned to goo? And that sad Astelia! I bet it will return from its roots. The couple I left in place after our last bad winter did eventually return. Of course they're zapped now too. Oh, except for A. 'Red Devil' - the next time you're at Cistus grab one of those. It's been amazing for me. Oh, I know...the agave was a 'Blue Flame' an attenuata, I think. From Means several years ago. Surprisingly there's a pup at the base that is largely untouched, so all might not be lost. Astelia...good to know. Red Devil - that's new to me! I'll grab one, for sure. So do you think the Feijoa will come out of it? Let us hope. Just to save you the work, and heart-ache, should you ever get another. A. attenuata isn't borderline hardy for us. It's a wimp. Temps in the low 30's can melt it. On the other hand it's very easy to overwinter indoors, near a window. Just plop it down and leave it until late spring. Aaah, I must have had it wrong, thanks for the tip, Danger! If I find another, I shall do so. It is such a tough time of year for us gardeners! I must admit I find it depressing in the garden, despite the first signs of new growth. It is so hard to imagine it any different to the muddy mess it is at the moment! Always sad assessing your losses after a spell of bad weather. Hopefully some things will surprise you and rally round! I do hope so. Your garden has so much potential just waiting for some good weather so it can unleash itself! Oh Jane, it is such a tough time of year for us. It is hard to imagine lush green growth. I hope we shall all be pleasantly surprised by what survived! Thanks for the camaraderie in this adventure called gardening! Assessing winter damage is always a sad chore. Looks like it's not too bad there. You know quaking aspen sends up suckers from its roots, right? We had one in our yard back in Massachusetts, and were forever cutting down baby ones that came up all over the lawn. Sad indeed :( But necessary to sidestep future mistakes. Thanks for the tip on the aspen - we actually planted it with that intent - it's a large area back there so we are hoping for a bit of an aspen grove in time. Hopefully they won't take over the world! Yay for Effie and her beautiful egg! I didn't think chickens would lay during such harsh weather. Amazing that the hebes can look that good after all the ice and snow. Such a hard winter for your new garden to endure -- let's hope winter has done its worst by now! Yay for Miss Effie! Really looking forward to following your progress this year!